How do I create a peer review assignment? When creating an assignment, you can require students to complete a peer review of another student's work. Learn more about peer review assignments. For peer reviews, you can manually assign peer reviews or choose to have Canvas automatically assign peer reviews for you. You can also choose to allow students to see other students' names in peer reviews or make them anonymous. When anonymous peer reviews are enabled, instructors and TAs can still view the names of student reviewers in SpeedGrader and in the student submission page. However, if anonymous grading is enabled in SpeedGrader, the names of both students will be hidden in SpeedGrader but not in the student submission page. To complete the peer review, students are required to leave at least one comment. If you include a rubric, they are only required to complete the rubric. To learn how assignment and peer review due dates appear in a student's To Do list, view the Peer Review Tips PDF. Peer reviews cannot be used with External Tool assignments. Students can see peer review comments when an assignment is muted. 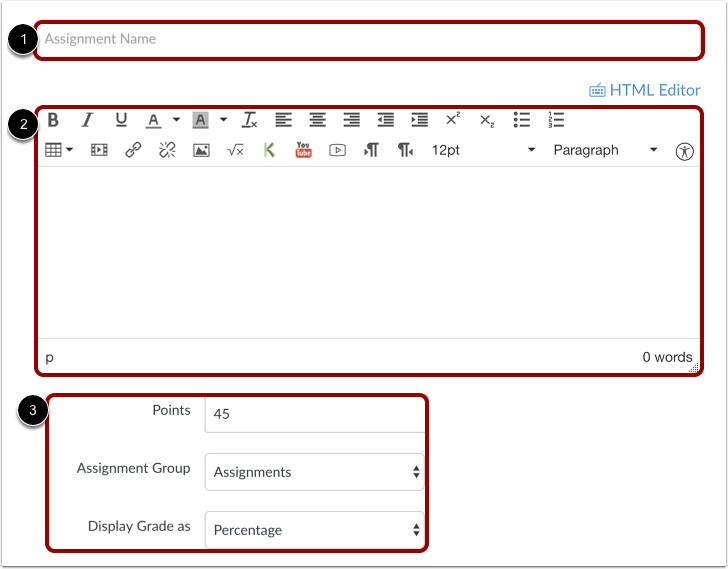 However, students cannot see instructor comments until after the assignment is unmuted. Enter a name  and description  for your assignment, as well as any other assignment details . Note: The Rich Content Editor includes a word count display below the bottom right corner of the text box. In the Submission Type drop-down menu , select your preferred submission type . Note: The External Tool submission type does not support peer review assignments. 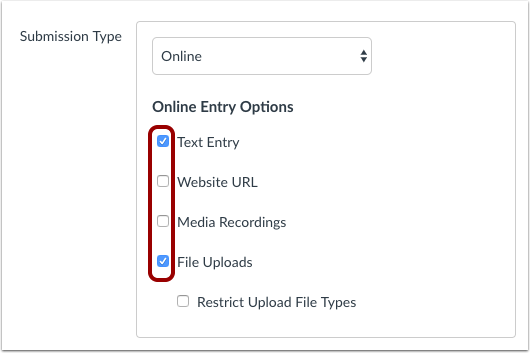 Select the checkboxes for the types of online entries allowed in the assignment. Peer reviews can be used with group assignments. If you want to create a group assignment, click the This is a Group Assignment checkbox. Click the Require Peer Reviews checkbox . By default, peer reviews are assigned manually . If you want to assign peer reviews automatically, select the Automatically Assign radio button . Note: Peer reviews must be manually assigned for On Paper and No Submission assignment types. 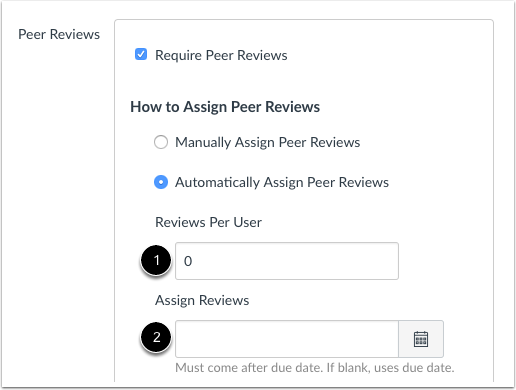 If you automatically assign peer reviews, the menu displays additional options. In the Reviews Per User field , enter the number of reviews each student will be required to complete. In the Assign Reviews field , use the calendar icon to select a date or manually enter the date for student peer reviews to be assigned. The Assign date must come on or after the assignment due date. If left blank, Canvas will use the assignment due date. In group assignments, you also have the option to allow intra-group peer reviews. Peer reviews require a student to review an individual submission by another student. However, group assignment submissions are made by one group member on behalf of the entire group, and all group members have the same submission. 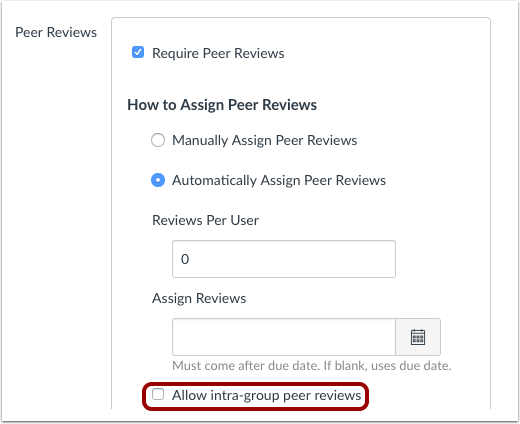 By default, the Allow intra-group peer reviews checkbox is not selected, which means Canvas will filter out members of the same group when automatically assigning the reviews. However, selecting the checkbox allows assignments to be truly random and disregard student group associations. To allow Canvas to automatically assign a peer review to a student from within the student's own group, select the Allow intra-group peer review checkbox. If you want to make peer reviews anonymous, check the Peer Reviews Appear Anonymously checkbox. Note: Canvas DocViewer does not support anonymous comments, so it cannot be used for annotated feedback on assignments with anonymous peer reviews. If you are ready to publish your assignment, click the Save & Publish button . If you want to create a draft of your assignment and publish it later, click the Save button . 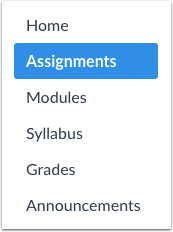 When your assignment is saved in a draft state, you can return to the page and publish it at any time by clicking the Publish button. 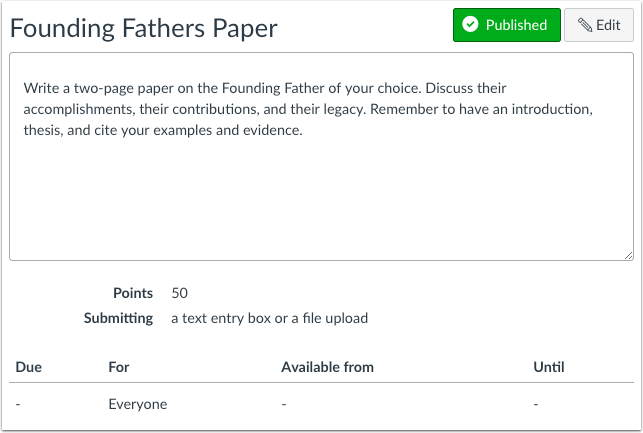 You can also attach a rubric to the assignment for students to fill out when completing peer reviews. To add a rubric to the assignment, click the Add Rubric button. Previous Topic:How do I use peer review assignments in a course? Next Topic:How do I manually assign peer reviews for an assignment? Table of Contents > Assignments > How do I create a peer review assignment? Re: Peer Response on Canvas? Re: Is it possible to set up a rubric that students can fill out to evaluate each other's speeches?